There is a paper describing ODDT Open Drug Discovery Teams app. 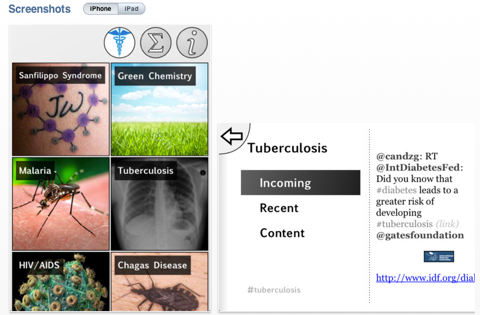 Investigators of rare and neglected diseases can access some of the latest research in the field, plus data about the disorders themselves, through a recently launched free app for Apple devices. Open Drug Discovery Teams (ODDT) is now available on the iTunes Store. The idea behind ODDT is that there are many rare of neglected diseases that might benefit from collaborative efforts from scientists from multiple disciplines, ODDT is an application that supports informal interactions, provides a means to explore relevant information in a flipboard like interface in particular information tagged by other scientists with similar interests. The image below gives you an idea of the topics currently discussed. This slideshow explains the genesis of the project, and how it has evolved. So why not fire up iTunes and download the free app and get involved?